Then, why won’t Nigeria and Nigerians hate you when everything you touch become money as in the case of the Jews? Everything you lay your hands on become business, everywhere you go blessing becomes prosperous. And worst of all, after the War, Awolowo and his gangsters teamed up and shared our fathers’ property and called it “an abandon property” and irrespective of all the millions our father’s had in the bank, two two naira was given to them. Today, we are the richest in the country. The Jews were hated because they are “God’s own people”, “the Chosen Race”. So Biafrans our own case will not be different. How many countries in the world bear the names: Chidiebere, Chukwuma, Chidinma, Chinaza, Chinedu, Chibundu etc. Most of the names we bear is prefixed “Chi” (God), meaning we are the Chosen race, the Chosen People. It was claimed that Jews killed Christ and in Nigeria it was claimed that Biafrans masterminded July 1966 coup that left most of Northern soldiers dead. The motives behind the coup was, only made known in the words of Lord Stonham: “vicious pretexts”, merely put forward to justify “evil motives”. Reina Ana said, “People hate Jews because they are jealous of the intelligence of the Jews, the Jew is a being superior to the rest of humanity”! This is just the summary of what is happening to Biafrans in Nigeria. Baker (1980) writes that “by 1966, across Nigeria, Ibos filled urban jobs at every level far out of proportion to their numbers, as labourers and domestic servants, as bureaucrats, corporate managers, and technicians. Two-thirds of the senior jobs in the Nigerian Railway Corporation were held by Ibos. Three-quarters of Nigeria’s diplomats came from the Eastern Region. So did almost half of the 4,500 students graduating from Nigerian universities in 1966. The Ibos became known as the “Jews of Africa,” despised and envied for their achievements and acquisitiveness”. The presence of Biafrans outside Biafra land, that is in other parts of the contraption called Nigeria was not always welcomed, in spite of the crucial roles that we play in economic development of the said country, and in the North we are forced to live in segregated “Sabon Gari” or “strangers quarters”. In the West, Biafrans still face the same problem. Publications and other media were used to launch a vicious and devastating attack on the Biafrans. The Northern People’s Congress, the then party in power in northern Nigeria, published what The International Committee called a highly defamatory article entitled “SALAMA: Facts must be faced,” which was contrived to “inflame the feelings of the Northern Nigerian masses to such an extent that, on the flimsiest pretence and as soon as the signal was given, the masses would pounce upon Biafrans and massacre them. This booklet portrayed the Biafrans in a very bad light and gave the masses in the North the sense that the Igbos were the source of all their problems. At the same time, the government of Western Nigeria also issued their own uproarious booklet called “UPCAISM” in which the Biafrans, called "strangers", were depicted as land grabbers who must be removed from Western lands and government positions. The booklets also displayed pictures of shops and stored owned by the Igbos in Lagos and indulged in undue character assassination. The International Committee noted that Western Nigerians were “invited to accept the inflammatory lie that these Biafran ‘strangers’ had expropriated Western Nigerian land and the fruits thereof”. In at least many cases, Nigerian soldiers actively joined civilian mobs; on October 2, 1966, Lloyd Garrison reported in the New York Times “that soldiers, defying the orders of their officers to keep the peace, opened fire on a large group of Igbos trying to board an airplane at Kano. These Igbos were attempting to join the estimated one million who, fearing for their lives, were fleeing to their ancestral homes in the east, which included both the region east of the Niger and portions of the Midwest Region, such as Asaba”. He continued “Nigeria had reached the brink of dissolution and despair” as the massive population movements continued—not only were Biafrans fleeing east, but non-Biafrans living in the east were rushing home. Garrison pointed to the “lonely task” of Gowon: “to reinstall discipline among his northern troops who not only joined civilian mobs in the anti-Biafrans massacres, but defied their own officers to the point of mutiny.” This “breakdown of the army as a responsive cohesive force” was to have further bloody ramifications in the year to come”. But in all of this I have never failed to remember the promises of Chukwuokike Abiama when he said “I will bless them that bless thee and curse them that curse thee, and in thee shall all the nations (Africa) of the earth be blessed.” Genesis 12:3. The difference between the Jews and the Biafrans is that the Jews have learnt their lesson and took their destiny in their hands gone back to their land and built themselves no matter what it caused them. 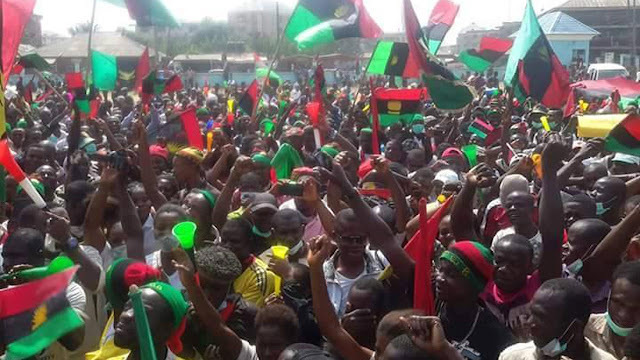 For Biafrans, it is as if many have not realized the need to be on our own and build our nation Biafra. “We must never let the wreckage of our barbaric past keep us from envisioning a peaceful future when law and democratic freedom will rule the earth.”- Gregory H. Stanton. So for any right thinking individual to wake up and say or think that restructuring of Nigeria will make Nigerians to love or accept Biafrans is a big joke. Referendum is the only answer to this question where the entire Biafrans will either accept or reject this evil enclave called Nigeria.